A former coffee plantation turned 43-room tropical design hotel set serenely in the bohemian hills of Santa Teresa, Hotel Santa Teresa is a rare oasis of style and relaxation, with a beautiful haven of a spa that feels a world away from Rio’s colourful chaos. Many of the extensive range of treatments are inspired by the Amazon’s healing properties, from Xingu massages to Amazonian oil baths evolved using potent native ingredients. Post therapy, soak up the views over Rio from the lovely, hibiscus-framed pool or head for a fresh juice at the atmospheric Bar dos Descasados, where crimson daybeds overlook Santa Teresa’s honey-coloured rooftops. 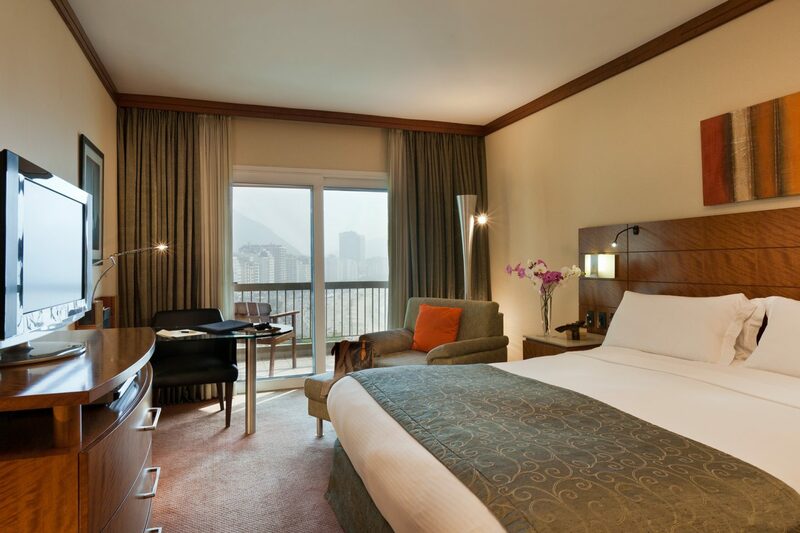 Thanks to its authentically Brazilian design, great service and destination restaurant, Hotel Santa Teresa is considered to be one of the city’s leading hotels, as suited to couples and families as it is to business travellers. While dozens of hotels line Rio’s golden shores, few offer the same value for money as this understated spot that borders the beach between Ipanema and Leblon. Defined by a cheerful, Scandi-esque minimalism, the 100 rooms are pleasant, if not design award-worthy, and all come with floor-to-ceiling windows that face onto the glittering blue sea or out along the beaches. It’s the 360-degree view from the Espaço 7zero6 rooftop restaurant, headed up by chef Patrick Bolle, that makes this such a favourite with locals for business breakfasts and weekend brunches that roll on till 2pm. While there’s an infinity pool and terrace for lounging and toasting the sunset, its prime location also means you are in easy walking distance from some of the city’s best bars and restaurants. 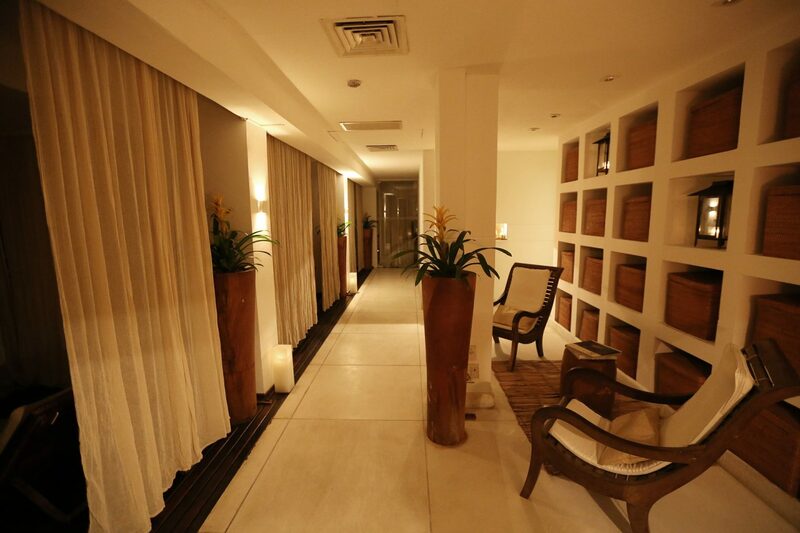 Sleek, understated and affordable, Praia Ipanema ticks a lot of boxes whilst remaining refreshingly free from hype. Secluded, intimate and elegant, the seven-room Vila Santa Teresa offers the sort of top-level boutique hotel experience that Rio has long lacked. 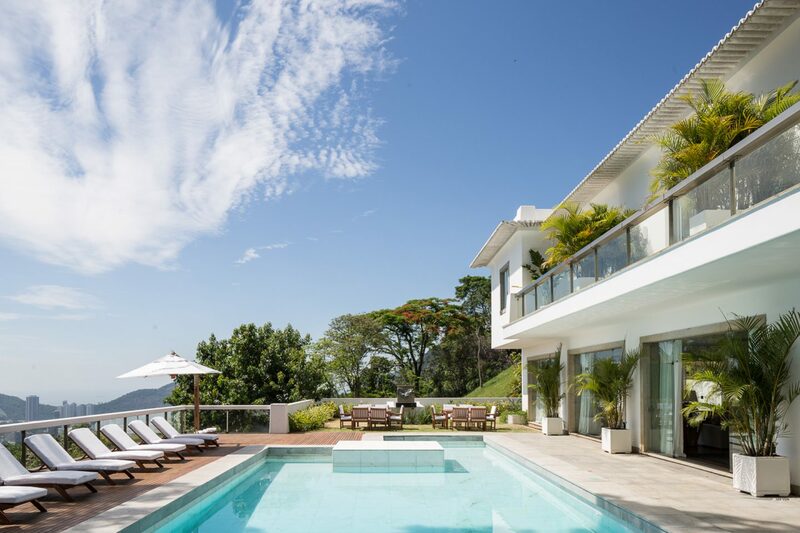 The passion project of one of Rio’s most notable families, this lovingly restored ’70s modernist mansion is set at the pinnacle of their five-hectare private estate in the bohemian neighbourhood of Santa Teresa, giving guests rare access to a world and lifestyle that is usually off bounds. Welcomed by staff who have looked after the family for 20 years, guests are invited to live the home as their own, with customised check-in and check-out times and a driver on call. Spacious, sunny living rooms open out onto a gorgeous wooden deck, 15-metre pool and spectacular views over Rio’s cityscape, and thanks to the tennis court, ample gardens and massages under the century-year old mango tree, it feels more like a countryside retreat than city bolthole, even though the buzz of Ipanema is only 20 minutes away. Away from the hustle and hum of boisterous Copacabana Beach, the Windsor Miramar is a romantic yet understated oasis of style and calm. From the minute you cross the threshold, allow the attentive staff to satisfy your every desire. The focus here is on service, with extra touches including a butler on every floor and a premium beach service with your own personal lounger and beach boys delivering fresh tropical fruit on the house. Perched high on the 16th floor with poolside bar and steam room, the infinity pool blends in with the electric beach vibe while affording the luxury and privacy associated with a romantic retreat. While there are 200 stylish suites to choose from, don’t miss out on the Master Suíte for a decadently romantic stay. 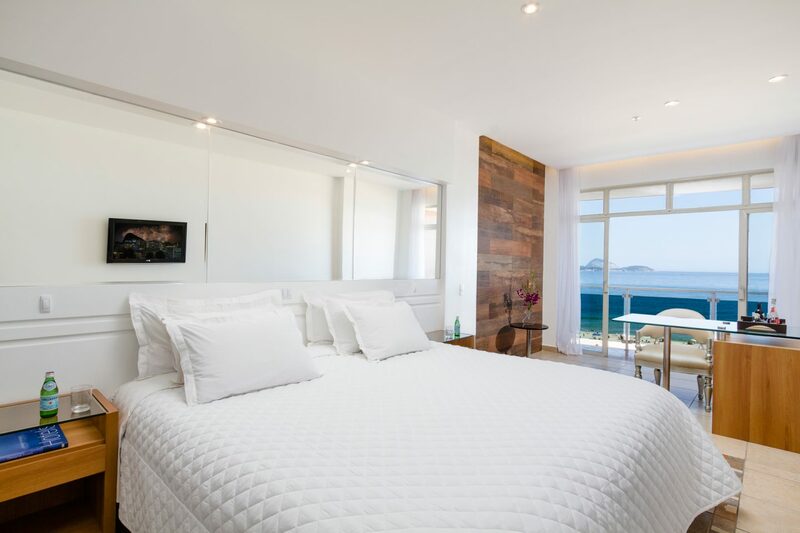 Classic yet contemporary thanks to design by architect Paola Ribeiro and art by artist Anamélia Moraes, it’s the ocean views that steal the show, perfectly positioned to gaze out into while snuggled up in the king-size bed. The grand dame of Rio’s hotel scene, this Belle Époque beauty has been a city icon since it first opened in 1923 along Copacabana Beach. While traditionally beloved for encapsulating old-world glamour, stellar service and spacious rooms, in recent years, it’s evolved into something of a foodie mecca, its three restaurants drawing a diverse crowd. To catch Rio’s bright young things, a specialist sake menu and fantastic cocktails, head to Michelin-starred pan-Asian restaurant MEE, whilst across the Olympic sized pool, genteel types dine on refined Italian at the Cipriani restaurant. Both restaurants offer Chef’s Tables for die-hard gourmands to watch the masters at work. If an extravagant buffet, unlimited bubbles and great people watching are more your thing, book in for Sundays at pool-side brasserie Pérgola, arguably the best brunch option in town. Set along the coastal road that leads to São Conrado from the chic beach of Leblon, what the Sheraton enjoys in spades is space. A playground for all the ages, count the three swimming pools, two tennis courts, a children’s playground and access to a little semi-private beach in front of the hotel and there may be more leisure options than you know what to do with. 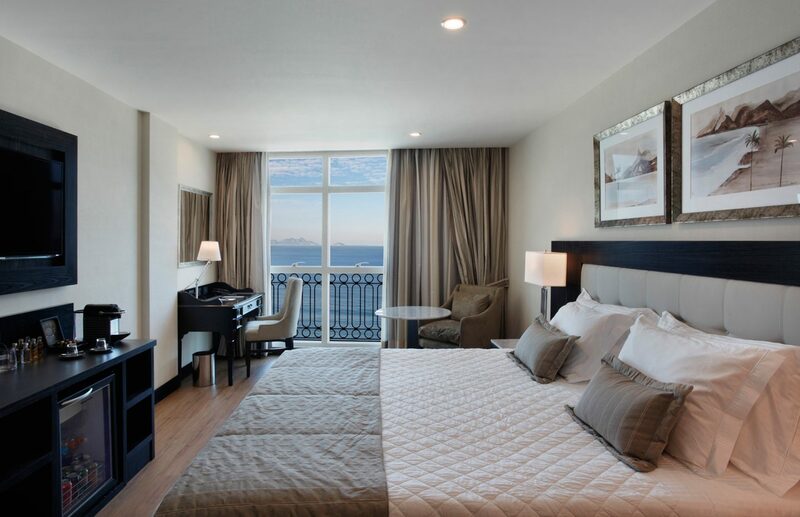 Rooms are contemporary, tasteful and well-suited to families, ranging from suites with mini-kitchens to spacious duplex apartments with fabulous sea-views and overhanging palms. As to be expected with Sheraton Hotels, service is superbly efficient and ever smiling, more than making up for the lingering lack of cool that can come with being a chain hotel. 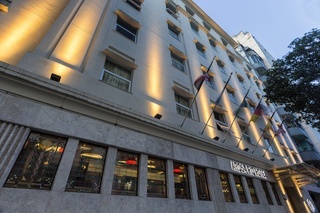 Conveniently located on the curve where Ipanema turns into Copacabana beach and a 20-minute cab ride to the financial district, the 388 room Sofitel is well suited to business travellers, with facilities ranging from a business centre to 16 meeting rooms and a 600-capacity Convention Centre. What helps Sofitel stand out is the fact it doesn’t forget it’s located in one of the world’s most dynamic beach cities: the hub of the hotel is the Atlantis restaurant, set around a pool overlooking Copacabana Beach, where guests can watch the fishing boats come in over breakfast and return to unwind with sunset aperitifs. 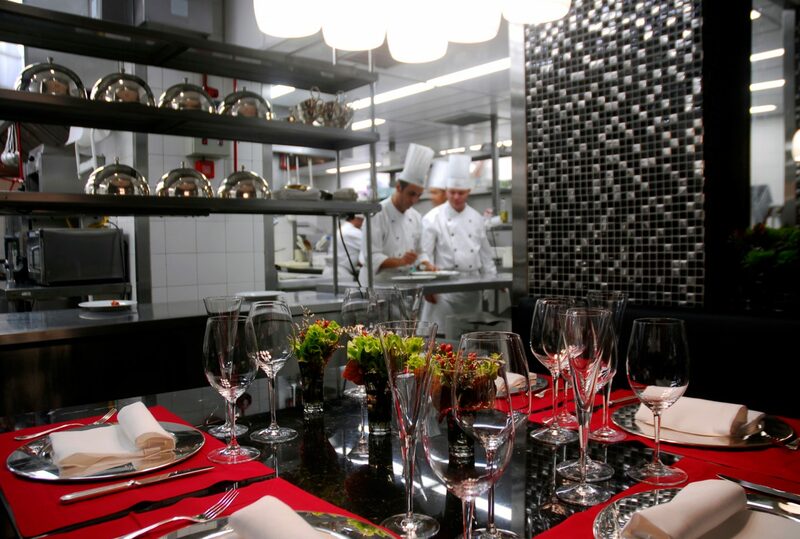 For dinners that mean business, head to the Michelin-starred Le Pré Catalan, where chef Roland Villard’s Amazonian tasting menu is a gourmet experience to write home about. 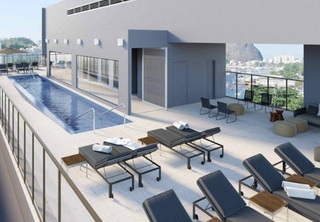 While the design may feel slightly tired, the hotel is set for a serious overhaul post the 2016 Olympics, designed to re-position it as one of the best in town. 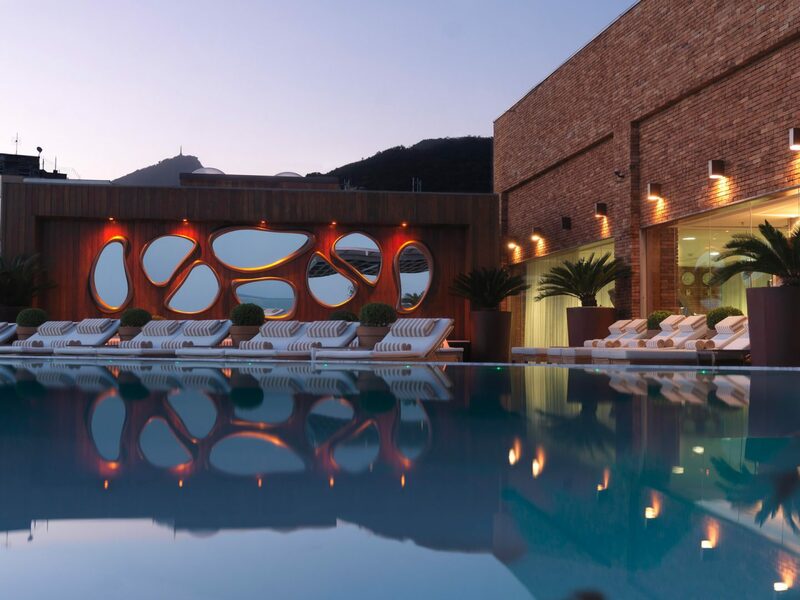 Thanks to its A-list clients, fabulous rooftop infinity pool and stand-out design, 89-room Fasano has been the city’s chicest hotel since it opened in 2005. Designed by Philippe Starck in homage to Rio’s bossa nova scene, his signature flamboyance plays out across a patchwork of sumptuous materials, from a Chinese golden onyx pool bar to a reception counter crafted from an eight-ton fallen Pequia tree. It’s all balanced by undertones of old-world Italian style brought in by the hotel’s owner Rogerio Fasano, combining butter-soft leather armchairs and red-bricked walls in sultry cocktail den Baretto-Londra with collector’s pieces from design greats such as Sérgio Rodrigues, Voltaire and Gaetano Pesce. It’s a hotel that oozes style: staff flit around in vintage uniforms designed by Ocimar Versolato, while up on the roof, beauties pose by the infinity pool and there’s always a magnetic ‘who’s who’ vibe come sunset drinks. 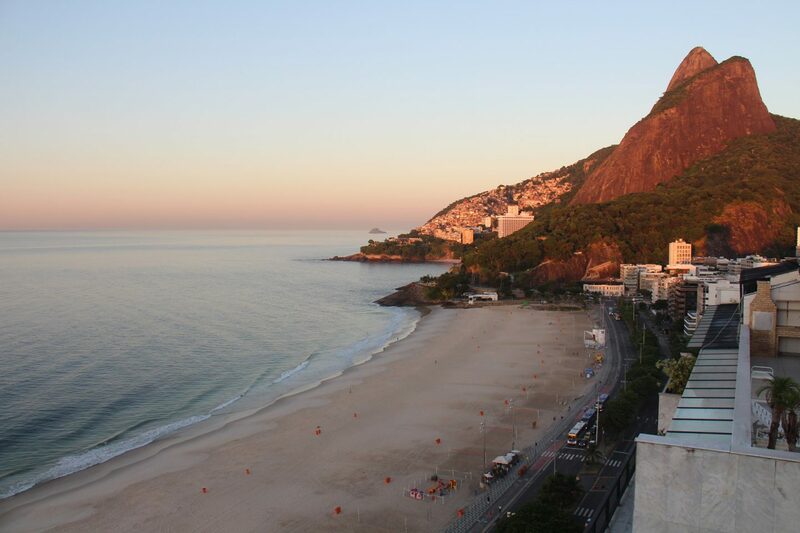 It’s worth the extra investment for an ocean-front suite so you can watch Ipanema Beach frolic from your balcony. It’s the personalised attention from the hip owners, a well-connected French-Brazilian couple, that make this new 12-room independent guesthouse such a find. Its secluded location, set on the jungle road that connects Santa Teresa with Zona Sul, means you’ll need to take taxis to explore, but this also adds to the sense of adventure. 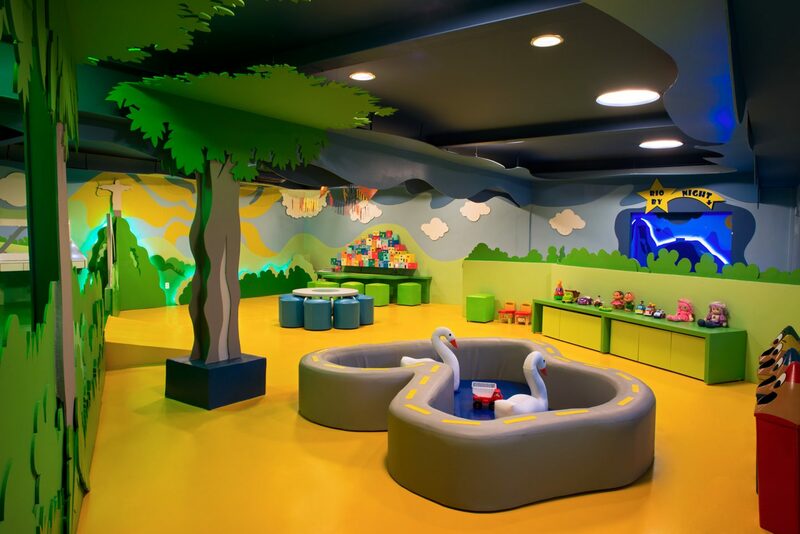 Designed by Carioca architects InTown, interiors are vibrant and stylish, combining modernist design pieces with graffiti paintings from leading Carioca street artist Toz. While the open-plan living rooms make for great lounging, most of the action takes place up on the chic wooden roof-terrace and pool, where a trendy young crowd come for cocktails at the bar and to soak up the fabulous views over the city. Check in to the master suite to enjoy a stand-alone tub and expansive balcony. Overlooking the golden sands of Leblon beach on some of the city’s most expensive real estate, Marina All Suites lays claim to one of the best locations in town. While neighbouring Ipanema draws the tourist crowds, locals love Leblon for its safe streets, hip boteco scene and chic restaurants. 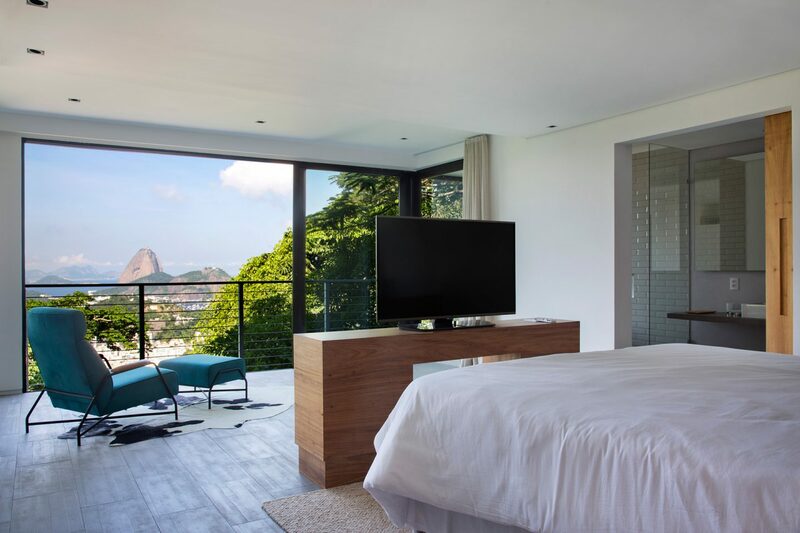 The 41 bedrooms, most of which come with stunning sea views, were originally decorated by individual Brazilian designers, and while efforts have been made to homogenise them, the design conscious should enquire about options when booking. While the rooftop pool is strictly for plunging, most guests make the most of the hotel’s beach service on the sands before strolling back for sun-downers. While there’s always a fun, young crowd spilling along the sidewalk outside sushi spot Bar do Lado, cocktail lovers should head to Bar d’Hôtel, set on the second floor and run by mixologist extraordinaire Tai Barbin. A rising star on Rio’s cocktail scene, his talents have helped turn the bar and restaurant, which specialises in French-Brazilian fusion food, into something of a destination dining spot.